Let me start out by saying that I think Mongolia is one of the world's greatest countries to travel in. The magnificent countryside, and nomadic culture, are truly spectacular and make Mongolia a world class destination. However, every country has its drawbacks and Mongolia is no exception. While the Lonely Planet always talks up every facet of every country as fantastic, offering little basis for comparison between different places and countries, it's important to me that visitors have accurate expectations about Mongolia. I've talked about the many positives of Mongolia on my other pages, but here are some of the bad things about Mongolia travel. For me, they're well worth putting up with; but have a think about whether you're okay with it. If 'yes', your expectations will be set which will help avoid dissappointment. If 'no', consider visiting somewhere else. These days, in Ulan Bator, there is enough international cuisine and decent restaurants to keep all but the fussiest travelers happy. Head outside UB, though, and restaurant choices become quite restricted, and most westerners find the food (largely mutton and/or dairy) to be salty, fatty, and rather unpalatable. For me, who loves the cuisine in most Asian countries, food is probably the single biggest reason not to go to Mongolia. Spend a month out in the countryside, and you will be amazed at how repulsive the taste of mutton fat can become. Of course this goes both ways: the Fairfield Hostel in Tsetserleg, which serves great burgers, pastas, breads and cakes that travelers rave about, routinely has Mongolians outraged about how bland, tasteless and overpriced the food is ("there aren't even any lumps of fat! "); locals will warn visiting tour guides and drivers not to eat there! How to deal with this? Either: 1. just endure it and tell yourself that people happily live their whole lives eating this stuff; 2. go on a reputable mid-range or luxury tour of Mongolia, where guides are accustomed to feeding Westerners, or 3. take your own hiking stove and utensils so you can prepare your own meals. The latter is a good option for budget travelers, particularly now that fresh fruit and vegetables are available in all aimag capital cities in Mongolia. 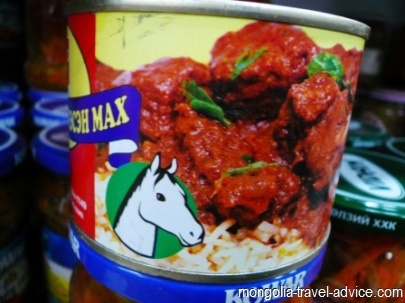 Some fantastic culinary experiences await you in Mongolia. "...And when the master has drunken, then the attendant cries as before, and the guitarist stops. Then they drink all around, and sometimes they do drink right shamefully and gluttonly...And when they want to challenge anyone to drink, they take hold of him by the ears, and pull so as to distend his throat, and they clan and dance before him...and when he holds out his hand to take the cup, they quickly draw it back, and then again they come back as before, and so they elude him three or four times by drawing away the cup, till he hath become well excited and is in good appetite, and then they give him the cup, and while he drinks they sing and clap their hands and strike with their feet." - from journal of William of Rubruck, Franciscan Missionary, year 1253. 750 years later, a significant proportion of Mongolian men suffer a sense of dispossession, unemployment, and social problems similar to indiginous communities in Australia, New Zealand, and North America. Sadly, this often translates into alcoholism. In any town in Mongolia, you can expect to see some old drunks around in various states of intoxication. These folk are more worthy of pity than fear, but a young group of drunk men can occassionally be aggressive and threatening. How to deal with this? For men, keep your eyes downcast and act disarmingly rather than aggressively, or you do risk a beating (it does happen, particularly in or just outside nightclubs). Try to avoid chatting with local women at bars when there are drunk men around, as they are likely to see this as a threat and could use this as an excuse to beat you up. Interestingly, I felt safer with my fiancee than without her, as the men could not suspect that i was there after their women. For women, there have been (very) rare instances of drunk men being sexually aggressive. This doesn't mean you should be paranoid the whole time, but just be aware of it and be firm in rejecting unwanted advances in the unlikely event they do occur. If it's really physically aggressive, don't be afraid to push men off or scream if they're becoming aggressive (Mongolian women will give a drunk a good slap!). If all else fails, kick them in the balls and run. 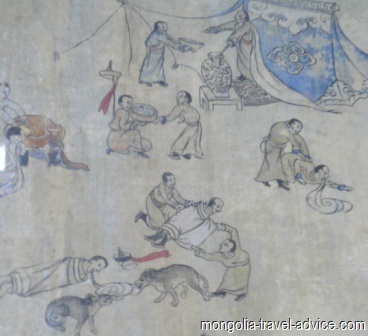 According to these murals of life in Mongolia in the Bogd Khan era, Mongolians have traditionally been partial to a drink. Every visitor to Mongolia spends some time in Ulan Bator. The city has some modern comforts, decent attractions, and is well worth 2-4 days, depending on how much time you have in Mongolia. The other aimag capitals, however, really don't have much to recommend them as far as tourists are concerned. Some, like Olgii, Khovd, Uliastai and Tsetserleg, are pleasant enough but have little to occupy you for more than a day. Others, like Moron, Erdenet and Choibalsan, really are the pits, full of drunks and a general air of hostility towards foreigners. Unless you're a missionary or a volunteer, or the local nadaam festival is going on, there isn't much reason to stay long in these places. How to deal with this? I've said it before on my site and I'll say it again: plan your trip so that you spend more time in the spectacular countryside, and as little time in the cities as necessary to stock up on supplies and head out again. Potentially another point on a list of reasons not to travel to Mongolia. Those coming to Mongolia and expecting a nation of smiling, quaint little extroverted people like Thailand will be sorely dissappointed. Don't expect everybody to smile at you or act warmly, in fact, sometimes you'll find their behaviour downright rude! Of course, not everybody is unfriendly, but part of dealing with this those who are not is just cultural understanding. Mongolian people come from a proud warrior lineage, and to show emotion to strangers can be seen as weakness. You will see this when you view Mongolian family or wedding photos: none of them are smiling! So for most Mongolians, it is often a pride thing. It's just the way it is and Westerners should just accept it as a cultural difference. The unfriendliness seems to happen most in the aimag towns and cities; go into a nomad's yurt in the countryside, however, and you will be amazed at the warmth and hospitality with which you will be treated. Another reason to plan spending more time in the countrside and less time in Mongolian cities! One negative of Mongolia travel is the way Mongolians dispose of their trash. Given the littering habits of most Mongolians, it's lucky there aren't too many people per square mile or the place would be full of trash. Things are slowly changing as an environmental consciousness begins to form, but old ways die hard, and the visitor will be amazed at how locals will casually throw trash out the car window, or smash discarded bottles in the middle of town. Many developing countries have issues with litter, but Mongolia seems particularly bad in this regard. A little more effort on their part would help preserve the natural beauty of Mongolia for the generations to come. I'm usually one to advocate a 'non-intervention' approach to travel, and usually 'do as the Romans do', but in this case I try to lead by example. You should, too. So, when you're out camping and your driver or horse wrangler takes your trash bag and throws it down a marmot hole, you should retreive it and insist that it is carried back to town and disposed of properly. They may think you're a baffoon and try to throw it away again, but eventually they'll relent and accept your decision -and hopefully learn for next time. Camping: even though you've asked your driver to take a tent, there's a likelihood he'll 'forget' it, or be unwilling to use it. After all, why would you want to camp out in the middle of nowhere and be cold and uncomfortable, when there are perfectly good yurts (gers) nearby to stay in? The countryside is spectacular for foreigners visiting on a short trip, but for locals who have lived near it all their lives, it's nothing special. Why do these stupid tourists want to spend 3 days out here where there's nothing to do? I know they said 3 days, but this is so boring I'm going to tell them we're leaving tomorrow! Time: booked a driver to take you to town X, via sight Y? Well, if he's not accustomed to foreigners and their strange practices of leisure trips and sight-seeing, he's going to get the job done as quickly as possible. That means you'll be traveling on his time, rather than yours. He'll be there waking you up at 4am, or maybe he'll decide you're leaving at 9pm that night -so you won't get to see anything in the dark. Well, you said you wanted to get to town X, and that's what he's done: what are you complaining about?! You are much more likely to avoid these incidents if you organize your trip in advance, with a reputable tourism operator. However, if they do happen, you should be firm in communicating what you want and what you paid for, but be polite and conscious of the vast cultural differences between you and them. This isn't to say that if some shonky tourist operator makes promises and that he fails to deliver, then refuses to offer you a refund, that you shouldn't put up a fight. 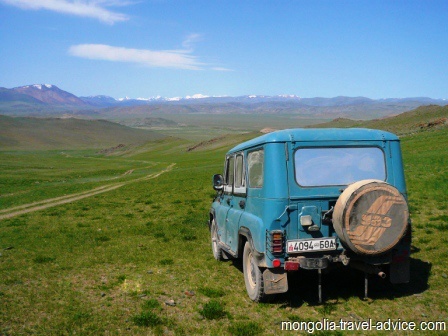 Independent travel (unless you acquire your own means of transportation) in Mongolia as very difficult and can be dissappointing because you will not get to see as much of the country as you would like to. I talk all about this on my page on independent travel but it's worth mentioning again here. It should be self evident that, Mongolia being a third world country, standards of accommodation are going to be lower than you would find in the West. The electricity won't always be working, the town's water supply isn't always running, some hotels can't afford to provide hot water 24 hours a day, the service isn't as good as it would be back home.... basically, all the things you might expect to happen in a developing country. However, I've seen so many tourists complaining about this kind of thing (the worst example being a group of Israelis loudly arguing for a 50% discount at a hotel in Olgii because the hot water wasn't on when they wanted showers!) that I thought I really should manage your expectations. You should travel to Mongolia with an expectation that even at the best hotels in town won't match what you might expect to find in the West. If that's something you can't accept, consider traveling to Hawaii instead. As I've said, Mongolia is a fantastic country, but there are some aspects that Westerners might find negative. If you accept that Mongolia is a developing country where people think differently, and don't expect everybody to follow your own Western values, then you are more likely to have an enjoyable trip. Enjoy your trip!! !